A few weeks before the 2013 election, Lee married the love of his life. Less than three years later, it had all gone wrong. How could something that seemed so right in 2013 fall so quickly into shambles? As Australia moves into a new and uncertain election, Lee heads out on the campaign trail to see if he, and the government, can discover what went wrong. Double Dissolution is a contemporary election campaign narrative that probes personal and political failures and upheavals, and explores possible futures, by a talented writer on the rise. 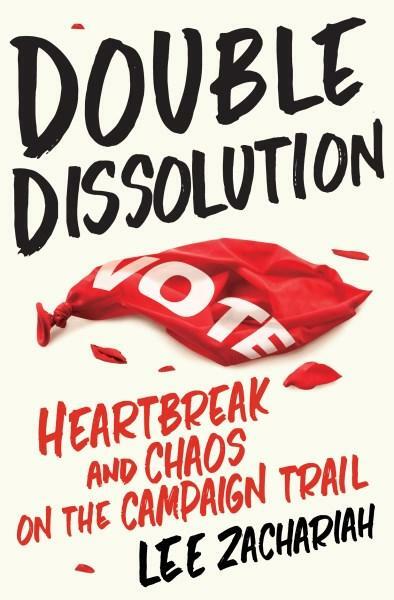 Lee provides a fresh, informed and suitably baffled viewpoint on the turns of Turnbull, the shifts of Shorten, the darkness of Dutton; he connects with candidates and voters on the road, discovering complacency, hope, and contradictory party narratives. As the people look for hope and the candidates look for power, Lee looks for answers. If his own fortunes are tied to those of the government, then this might be the most important election of his life. This is a humorous and intelligent work – a snapshot of Australian politics and society through a unique lens, highly relatable to a generation brought up with endless, though often illusory, choices, and increasingly alienating political messages. Lee Zachariah is a writer who has worked across film, television and journalism since 2003. He has written on politics and the arts for Vice, Junkee, The Age, The Guardian, The Big Issue, Inside Film, and many more. Lee co-hosted the ABC2 film comedy series The Bazura Project, and has written for The Chaser on The Hamster Wheel, The Checkout and The Hamster Decides, and on news satire show Shaun Micallef’s Mad As Hell.